Jodie Cramer has organised a weekend away with her three closest friends. It gets off to a bad start when she is run off the road and crashes her car. Waiting in the dark on an unlit stretch of bad road, with little phone reception, the situation reminds Jodie of another road in the dark. A flashback to the night when, at age seventeen, Jodie’s best friend Angie was murdered, makes Jodie jumpier and more stressed than she’s been in a long time. When the women finally make it back to civilisation, Jodie’s weekend doesn’t get any better. Her friends think she is having a breakdown, but they don’t see the danger she’s spent the last eighteen years trying to protect herself from. Matt Wiseman is a policeman on a career break. He’s working in his Dad’s car repair shop to give his injured knee a chance to mend, when he answers the call to rescue Jodie and her friends. There’s something alluring about Jodie, but Matt’s instincts are shot to hell and he doesn’t know if he’s reading her wrong, or why she’s asking so many strange questions. When he stops by the ladies rented barn, Jodie gives him a cryptic message. He leaves, chewing over it, until he comes to understand the danger she is facing. Jodie refuses to run and leave behind her friends behind and Matt is reluctant to play the hero, but neither of them can turn their backs on a deadly situation. Jodie held onto the steering wheel with clenched fists. Getting a grip, literally. Or trying to. She knew if she let go, her hands would be shaking from the adrenaline that was still pumping through her. This is the second novel by Jaye Ford that I have read. 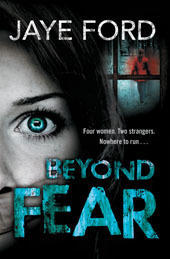 Beyond Fear starts with a great introduction into the main and secondary characters, while developing the sense that something is not right. Jodie’s emotion and fear is captured brilliantly, and you can feel the dark creeping in and threatening to suffocate you. Jaye Ford is brilliant at raising the suspense level gradually and sprinkling a whole heap of little clues throughout the story. Jodie and Matt are both interesting main characters. Neither of them are what you would call stereotypical. The bad guys, who I won’t give away, are well thought out and represent a threat level which justifies the way Jodie felt early in the story and the way Matt reacted. This was a fun read that I managed to get through quickly. I don’t read as much thriller/mystery/horror as I used to, and every time I do, I remember how much I enjoy it.